Dr. Effinger specializes in pediatric oncology survivorship, and in the late effects of childhood cancer and stem cell transplantation. Karen Effinger, MD, MS, is Assistant Professor in the Department of Pediatrics at Emory University School of Medicine. A pediatric oncologist, Dr. Effinger specializes in the late effects of childhood cancer treatment. She works in the Survivorship Clinic in the Aflac Cancer and Blood Disorders Center at Children's Healthcare of Atlanta, which sees oncology and bone marrow transplant patients who have completed their treatment. Dr. Effinger is a member of the Cancer Prevention and Control research program at Winship Cancer Institute of Emory University. 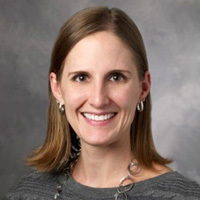 Nationally, she serves as the co-chair for the Children's Oncology Group Oral/Dental/GI/Hepatic Long Term Follow-up Guidelines Task Force and is a member of the Musculoskeletal/Functional Outcomes task force. She is also a member of the American Society of Pediatric Hematology/Oncology Early Career Council and Program Committee, and the American Society for Clinical Oncology. Dr. Effinger received her Medical Degree from New York Medical College in Valhalla, New York. She obtained her Master of Science in Epidemiology and Clinical Research from Stanford University School of Medicine. She completed a residency in pediatrics and a fellowship in pediatric hematology, oncology and stem cell transplantation at Lucile Packard Children's Hospital/ Stanford University in Stanford, California. Dr. Effinger's research focuses on physical and psychosocial functioning after cancer treatment with a particular focus in health risk behaviors, wellness, and physical function in childhood, adolescent, and young adult survivors. Additionally, she is involved in a joint cardio-oncology initiative between the Sibley Heart Center and Survivorship Clinic.